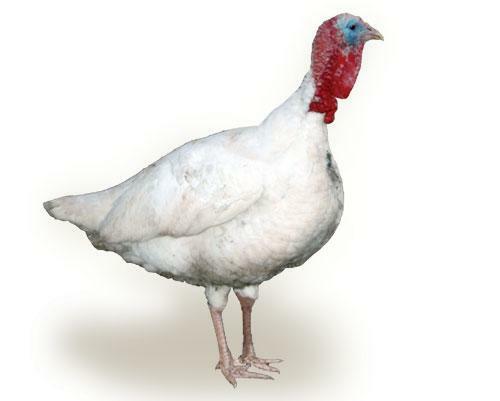 White Holland's originating in Mexico, were brought to Europe in the 1500's , first documented in England in the early 1800's, and accepted into the Standard of Perfection in the U.S. in 1874 - a very old variety of turkey. Because of their wide breasts and short legs they were originally an important commercial bird in this country in the early part of the twentieth century but have been replaced in that category by faster growing and larger varieties. Today's White Holland's are very rare and kept by very few exhibition breeders. On average, how many pounds of organic feed pellets does it take to bring a turkey poult up to butcher weight? An average turkey will consume approximately 75# of feed from birth to butcher. Turkeys are normally butchered at 20-25 weeks. You can go longer for a fatter bird. When do you recommend butchering the White Hollard -- what age? Typical turkey butchering is done @ 20-25 weeks of age. Can go a little longer to get larger birds. On average, what does this breed weigh at maturity...hens & toms both? An average female mature weight is 15-18 lbs. An average tom mature weight is 25-30 lbs. No, we are not able to ship out of the US. Do you ship to Canada? If not, do you know of a Canadian producer who could supply me with White Holland chick's? Sorry, we do not ship turkeys to Canada. Unfortunately we do not have a list of suppliers in Canada. We are no longer able to ship any poultry to Puerto Rico. Nice birds!We ordered 6 & lost one on arrival. The other 5 gave us 3 toms and 2 hens. We butchered all three toms at 8 months and they were 29-36 lbs dressed. We free ranged and fed whole flock twice a day, they lived in the same coop (locked up at night, free range during day) as my chickens and ducks. They only wandered a little bit, but always came in for meals. Hens became broody just before we butchered our toms. Temperament is great, we have three kids and had no problems with aggression. They are incredibly curious and followed me everywhere. Good Eating!My grandfather raised these in the 1950's as his favorite eating turkey! I remember them as being the best turkey I ever ate! I thought they were huge until I saw my first BBB bird.